Recording a stunning electoral victory in West Bengal for a record seventh time coupled with riding a strong anti-incumbency wave as well as breaking fresh ground in Kerala, the Left parties have not only emerged stronger but determined to take on the Manmohan Singh government in pursuing the reform process in national interest. In video: Communists sweep two out of five state assembly elections. In video: Left to increase pressure on UPA. Do you support India’s rejection of the demand for the demilitarisation of J&K? 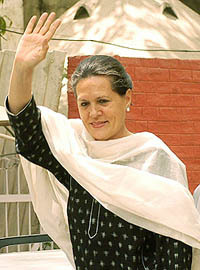 Sonia Gandhi acknowledges the greetings of party workers at her residence in New Delhi on Thursday after winning the Rae Bareli seat by a record margin. THE results of the Assembly elections are important not only for the governance of West Bengal, Tamil Nadu, Kerala and Assam; these are also going to have a bearing on national politics and policies during the next few years. Within hours of winning its traditional bastion of West Bengal and Kerala, the Left’s warning to the Manmohan Singh government was loud and clear — do not take our support for granted and our intervention on policy issues would increase. Concerned at the continuing overdrawing of power from the northern power grid, the Central Electricity Regulatory Commission today warned stern action against states, including Punjab, Haryana and Delhi, for violating the grid code leading to low frequency and breakdown at various places. Over six years after the incident, Central Bureau of Investigation here today filed charge-sheets in the fake encounter case against Army personnel for the alleged killing of five civilians at Pathribal in Anantnag district of South Kashmir. The charge sheets against five Army officers were submitted by the Investigating Officer, Ashok Kalra, before the Chief Judicial Magistrate, Srinagar this morning. A decision taken in a tearing hurry by the Punjab Education Minister, Mr Harnam Dass Johar, with regard to the closure of schools for the summer vacation has upset parents and their wards. Owing to the faux pas on the part of Mr Johar, teachers, who were to give homework to students for the summer break, failed to do so as the closure was ordered in haste.